Paella has been on my must-try list for a while. I’m so glad that I finally got around to trying it! 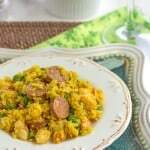 My husband raves about the paella he had in Spain. He’s definitely a big-time fan of the stuff. Soooo, I searched the web and chose to make Ina’s easy paella. Originally, her recipe called for lobster and keilbasa (odd combo, no? ), and although I love lobster, I opted for shrimp. I also substituted the keilbasa with chorizo for a more authentic flavor. Her recipe calls for Pernod, a licorice-flavored liquor and although I hate licorice, I did include it and am so glad that I did. It gave the dish an delicious flavor and it did not taste like it smelled in the bottle. A word of warning though: Pernod is expensive. I was looking for a small bottle, but could not find one so I bought the standard size bottle. Pernod is also used in the Bone Fish Grill’s mussels Josephine, so I justified the added expense because those mussels are definitely on my must try list too. Now, although this recipe has been rated as a 5-star dish by about 85 reviewers on the Food Network site at the time of this writing, I have to disclose that it’s not a very authentic dish. From what I’ve read, and what my husband has said, the rice is a really important component and Bomba rice is what should be used in the real deal. Ina’s recipe called for basmati rice (probably because it’s more readily available? ), but I substituted with jasmine rice. Next time, I’ll try to find the Bomba rice. I’ve also read that arborio rice can be substituted, but paella or Bomba rice is best. See the recipe note about adding stock when using Bomba rice. All in all, I enjoyed the dish and hope you give it a try! Source: Food Network, Ina Garten. Heat oil in large Dutch oven and add onions. Cover the pot and place it in the oven. After 15 minutes, remove lid from pot, stir, and place it back in the oven, uncovered, for another 15 minutes. 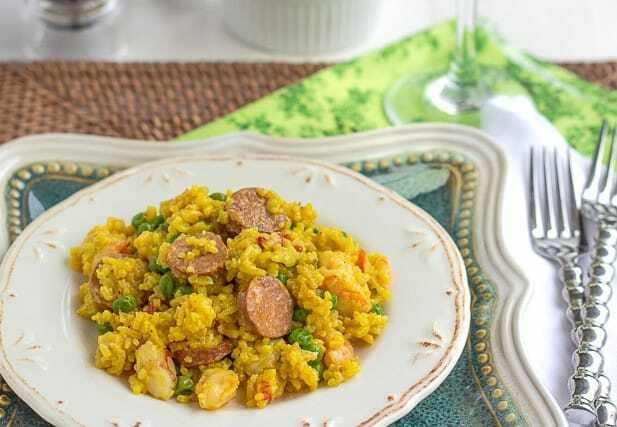 Transfer the paella back to the stove top and add the liquor, cooking for 1 minute or until the liquid is absorbed. Turn off the heat, add the meat and seafood, and peas and ocver. Allow the mixture to steam for 10 minutes and then top with parsley. Garnish with lemon wedges and serve hot. I used jasmine rice because I didn't have basmati, but for a more authentic paella, try using Bomba rice if you can find it. If using Bomba, add one more cup of chicken stock (3 cups of stock per 1 cup of Bomba rice). What happened to the sliced red peppers? I found I needed much more than 10 minutes in the final step to heat the shrimp and sausage through; I wished I had just put it back in the oven for 15 minutes.